#02: "Camp Pikachu" by ??? Well time to look at another Pokemon short. Story: The story is basically what it needed to be. 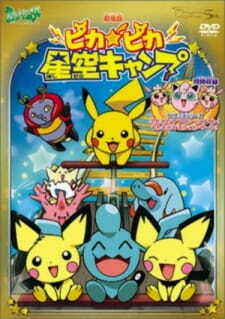 The Pichu Bros. have a problem and the other Pokemon help them out. It's nothing special and nothing amazing happens during it that changes the main goal for a bit. Art: The art is the same as the show with a few moments of CG. The CG is used sparingly and really only at one point of the short. Other than that, it's pretty good and can fully show the power of certain things, like Totodile's water gun. Sound: The music isn't really anything memorable like with other shorts I've seen. The only song I can remember is the intro song, which is a country song with Pokemon lyrics. Everything else is just Pokemon noises. Character: The only real character to talk about is the narrator. He's actually not annoying here since a lot of what he says is useful to telling the story and wouldn't really work without his input. As for the others, they're cute and playful, just like the other shorts. Enjoyment: I didn't enjoy this one as much as other shorts, mostly due to nothing spectacular really happening and the music wasn't catchy or memorable. However, it's not terrible, so I'd recommend a watch if you have nothing better to do.